Do you know about Mataram, the biggest city in Lombok? Well, it also has a suburb, and it’s called Ampenan. AKA the “Old Town”, it’s not as technologically advanced as Mataram and might not be as attractive from the outside. However, on the inside, it’s a goldmine for the inquisitive tourists. According to the local elders and the historians, this place takes its name from the word “Amben”, which translates to English as “Heaven”. Back in the day, it was a city under the rule of the Dutch conquerors – a colony. That is exactly why the population is so diverse, which can’t be said about the majority of towns/villages/settlements on the island of Lombok. Ampenan is home to all kinds of ethnic groups, and that’s the beauty of it. So, if you’ve been looking for that special place with unique vibes, this is it. Here, you’ll meet not only native folks but also Arabs, the Tionghoa people, Malays, and even Bugis. Oh yeah, there’s enough to see: the wonderful mix of cultures has turned the suburb into a great example of different communities living side by side with each other in peace and comfort. Once you enter Ampenan, you’ll instantly be overwhelmed by this fine combination. For example, the ancient Chinese folks have shops on the main street of Yos Sudaro, and that place is very “Asian”, if you don’t mind me saying that. The Arabs also have a strong presence, and they sell all kinds of exotic goods at their shops, immediately making the tourists feel like they’re somewhere in Syria or Iran, not in Indonesia. This suburb consists of a huge line-up of old buildings that have been around forever. That is exactly why they’re calling it the old city/town. There’s enough history here to grab the attention of even the most versed and “hard-boiled” tourists. I wasn’t particularly interested in all these cultures and their modern-day lives in Ampenan, to be honest, but it took me a day to fall in love with it all. It is spots like these that give you those once-in-a-lifetime experiences to take back home. The Chinese and Arab merchants are at the very heart of this town, and the Dutch heritage adds to the picture. What used to be a harbor in the past is now a landmark, a tourist magnet. Sadly, it’s not the most popular tourist spot in Lombok, but I’m hoping that will change soon. I honestly think that the foreigners don’t even know that there are other interesting places around here except for the Senggigi beach and the Gilis. You can find delicious foods, cold drinks, and affordable hotels/guest rooms in Ampenan as well, and it looks fantastic when the sun sets. On your way to this wonderful place, you might see a sign – Pura Segara. In Indonesian, it means the Segara Temple. Now, Ampenan is a Muslim village, and it’s unusual to see a Hindu temple right in the center of it. Folks generally don’t go “in” and head straight to the beach where all the fun and fuss is. I’m not saying the Lombok beaches aren’t amazing because they are. But this time around, resist the temptation to swim in the warm ocean and go deeper into the suburb. There, you’ll find a series of wonderful restaurants and cafes that serve the most delicious and the most affordable meals on the island. No, I’m not exaggerating! The hosts are all nice folks, and the grilled fish around here is life-changing (this is a fishing village after all). The beer and the drinks are always cold, the music is relaxing, and when the moon appears on the horizon, the locals start to sing and dance. It’s safe to say that if you’ve been looking for that “island lifestyle”, this is where you’ll get it. The fishing boats are in every corner, and they create just the right atmosphere for a wonderful evening. And while the natives don’t really speak English that well, the hosts and the waiters/waitresses will understand you and even give directions. They are Lombok’s finest, that’s for damn sure. Just like any other tourist in the world, I wanted to eat some of the local food, and it turned out to be delicious. Grilled corn, for example, is awesome, but do try their snacks, because they’re off-the-hook! Once I was full, me and my friends took a stroll down the road, along the beautiful beach. 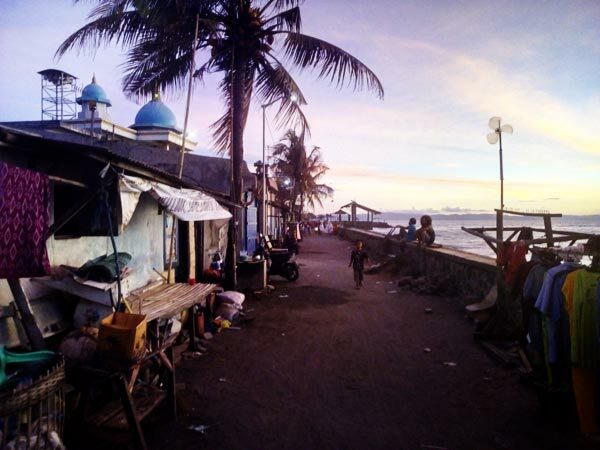 The Ampenan village is right next to the ocean, which makes it an even more attractive place for the potential visitors. The majority of the diners/restaurants/cafes here used to be government buildings (post houses, police offices – those kinds of things). The architectural heritage truly is enormous; so, make sure you take a good look at the city before you leave. While the nights are great for romantic walks at the beach, the days are perfect for hiring a cidomo and taking a ride through the narrow alleyways. Essentially, a cidomo is just a cart/wagon with a horse at the front. It’s another part of Lombok’s fine culture and is very cheap, just like everything else on the island. Cakranegara is on the other side of Mataram (the “right” side, if you take a look at Lombok in Google Maps). Keep that in mind when you land or just ask the ladies at the airport for directions. It’s pretty easy to get lost in a foreign place, especially when the locals don’t really speak your language (except for the staff, just like I said earlier). The weaving factories and the shrines are always open to visitors – check ‘em all out. Even though the tourists prefer to ignore this place (not all of them, obviously), the locals love Ampenan for the fair prices and the great food. The “eating spots” are almost always full of people, and they enjoy their grilled/fried fish. The retro vibes, the historical buildings, and the Danish “marks” will linger on long after you return home. What could be better than having a delicious food in the city and then grabbing some cold drinks to watch the sunset? Traveling is all about these tiny moments that will be with you forever. Leave all the gadgets behind and try to dive into this amazing atmosphere. When you get tired of it all, visit a temple or two and come back for more. Romantic couples, newly-weds, and “partners in crime” love to sit on the beach and stare at the ocean while the moon is high up in the sky. The pier that used to serve the Dutch in the previous century (in the 1948-1950 period) is now in ruins. And while there are a lot of fishermen there, the government of Lombok decided to turn Lembar into the island’s main port, which means soon it will be half-empty. If you’re a fan of partying, visit the bars that are open after 00:00. The hotels where you can spend the night or an entire week are all nice and cheap. Oh, and don’t forget to buy something from the market(s) as a gift for your loved ones! Alright, now let’s see how to get to this wonderful place. It’s quite easy and straightforward, actually. Once you land at the airport in Lombok, you’ll be “attacked” by a huge number of renting services and taxi drivers. Renting is quite cheap on the island and won’t cost you more than 5-10 dollars a day. Personal drivers do tend to bump up their prices for the foreigners, but you can still bargain a 20-30% off deal. The city of Mataram is approximately 40 kilometers away from the airport. It will take about an hour to get there (and a couple of minutes to reach Ampenan). Sometimes, traffic is horrible, and you get stuck in the middle of it. Yet, that’s rather an exception than a rule. Now, since you’ll be driving through the most developed areas of Lombok, there won’t be many landmarks along the way. Up in the mountains, or near the beaches, it would be best to drive yourself on a rental. But the “boring” ride from the Lombok airport to Ampenan is probably best to experience in the back seat, relaxed and chill. Or, if you’re in Bali, use a fast boat or a ferry to get to Mataram. There’s more fun in that, no doubt, but renting a boat and/or waiting for the ferry to take off might be a bit overwhelming, not to say frustrating. Besides, if you want to see Lombok, there’s no sense in visiting Bali first, right? The fish is unbelievably tasty. The drinks are nice and cold, and you can find Coca-Cola, Fanta and other brands from back home. The beach is magical! Thanks a lot for this review! I'm a huge fan of unique spots all over the world, and Ampenan sure does seem like one. Never knew Lombok had the capacity for so many different cultures. You can feel the historical vibes in pretty much every corner. Service is good, and the fact that this village is close to the beach is a huge plus. The beach is full of trash, at least it was when we arrived there. Senggigi is better, IMHO. Ampenan is an entirely different thing. It looks old, but that's a huge part of its charm. This is a unique place, a center where people with different traditions managed to live side by side. This is the biggest selling point of Ampenan. The rest is ok, I guess. Everything is cheap, including the hotel rooms.